These cupcakes! Oh boy...I could say so much about them but basically, they are just ridiculously good! Cooks Illustrated calls them "ultimate chocolate cupcakes with ganache filling" and I have to agree...they deserve "ultimate" status. They are really something else! Because take a look inside...these intensely-chocolate cupcakes not only feature a sturdy, dark, chocolate cupcake base, they have a dollop of chocolate ganache filling baked within them! 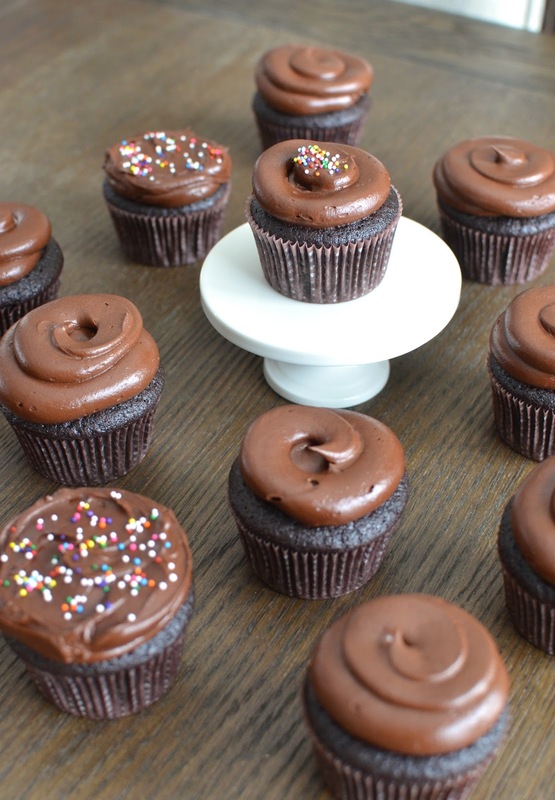 Finished with a top-hat of rich chocolate frosting, it is an ultimate chocolate cupcake experience. There are not many things I love more than chocolate and I'm pretty picky when it comes to chocolate treats, and I can tell you I was highly impressed and totally smitten with these. They also brought back a good personal memory, of chocolate cupcakes my husband used to get for us at a bakery in Tribeca called, Umanoff & Parsons, that's been closed now for over 10 years. Those chocolate cupcakes, which we still think about, live in my mind as the "ultimate" and this version comes very close (because it's hard to dethrone a memory that can no longer be tested)! Talk about 'better late than never'...it took years for me to finally make these cupcakes! I remember first seeing them in the magazine and then a post from Brown Eyed Baker cemented them in my mind. But I have to confess that making cupcakes is not my favorite thing to do. These cupcakes were a bit of a commitment but you'll be happy and thankful you made the effort when you taste it! Recently, I finally grabbed a good opportunity to make them...in celebration of this blog's 6th anniversary! Yes - hard enough as it is to believe - I'm still trying recipes, taking photos, and writing about some of them here in this little corner. It's been a rewarding hobby and a creative outlet, a happy place where I indulge and make delicious discoveries such as these chocolate cupcakes! 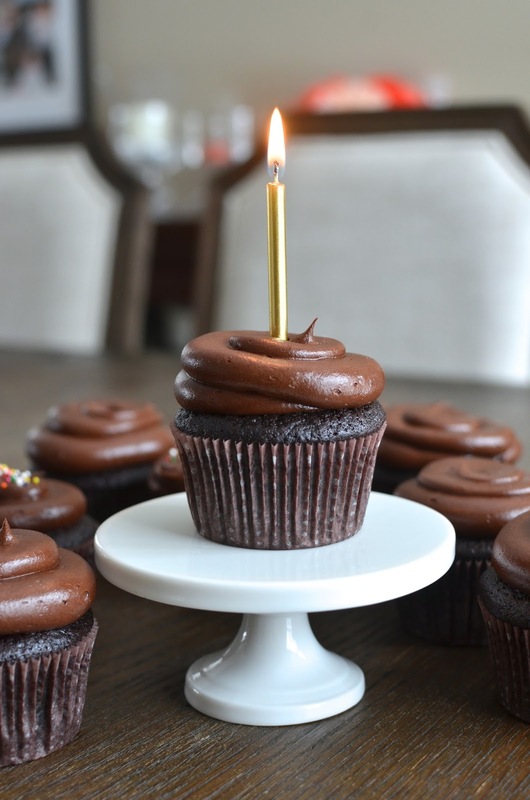 So let's pop a candle on top of one of these ultimate chocolate cupcakes and celebrate! To those of you who take the time to visit, leave a comment when you can, I really appreciate your encouragement and kind words! I don't know how much longer or at what pace this little blog will continue for but I hope I'll stay busy and make tasty discoveries for many years to come. I can't believe the little treasure trove of recipes I've amassed here that my family and I truly love and enjoy over and over again. It has been a real treat! 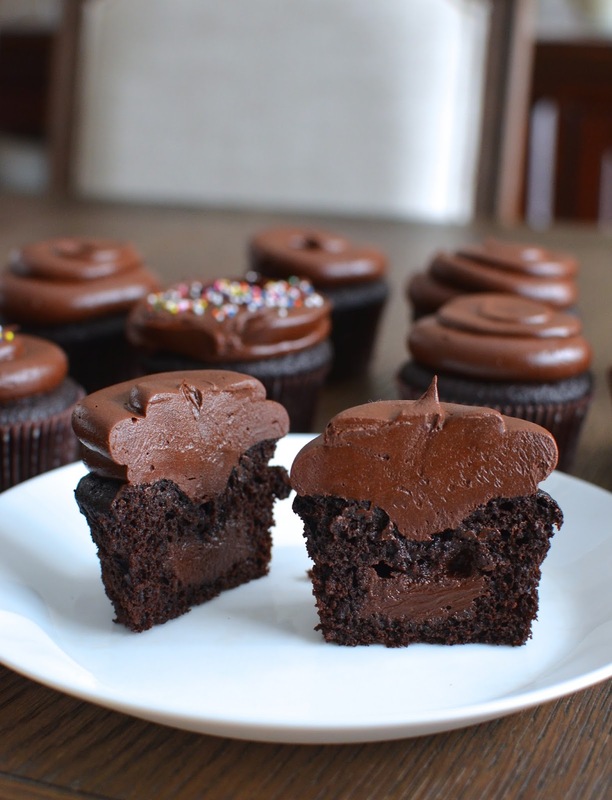 To all my fellow chocoholics out there, roll up your sleeves and tackle these cupcakes. You'll wonder if it's worth the effort and when you're done and finally sit down and take a bite of these deep, dark, rich (not particularly sweet), unabashedly indulgent cupcakes, you will think that "yes, they were totally worth it!" I made these cupcakes a few weeks ago...on a snow day in mid-March. I thought it would be a good day to tackle (a few) cooking/baking projects. It made for fuel for the boys' snow-shoveling efforts. Given the snow and ice we got that day, my husband (who did 99% of the cleanup work) worked off his cupcakes in no time! So I've been sitting on these cupcakes for a few weeks but that's nothing compared to the years it took me to finally try the recipe. I'm glad to finally spread the love about them now. We seriously couldn't get enough of them! These cupcakes aren't hard to make but there are a few steps involved. For starters, I recommend some organization/prepping ahead. When I have a recipe like this one that involves a few steps, I start by figuring out/setting aside what I'll need and chopping the chocolate the day before. This recipe requires quite a bit of chocolate (11 ounces in total even after I scaled down the frosting a bit) so it's good to get that prepared and set aside, ready to go. I'm no expert on anything, including making these cupcakes. But despite that, I enjoy the ability, via this blog, to share my experience with trying out a recipe. This is a forum where I can share what I learned and "figured out" in a recipe. I know that sometimes I'll look at a tempting recipe but have questions, and it helps when I read about someone's else experience. So with regard to this recipe, I had a few questions that held me back from making these cupcakes sooner. The ganache filling, for one. You make a basic ganache formula of chocolate and cream and let it chill for "no more than 30 minutes" but what texture should it be, exactly? I figured it should be firm (not a flowing liquid) but not a solid truffle texture either. If you make ganache, you know it turns from one state to the other very quickly. In the end, I dolloped the ganache into my cupcakes in the consistency you see above (after cooling for just about 30 minutes). Here are my dozen cupcakes out of the oven. 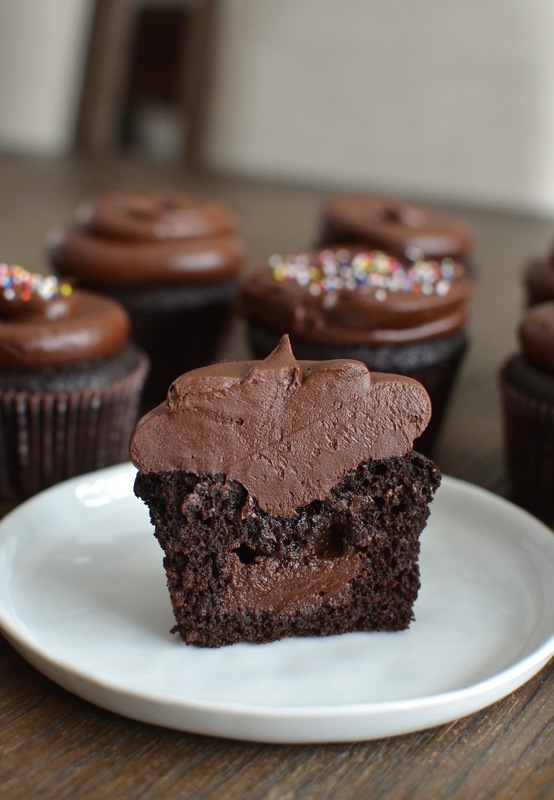 The cupcake batter rises around the ganache filling as it bakes, and the ganache ended up near the bottom. I imagine that if your ganache filling was a little looser, it might spread more within the cupcake and perhaps stay better suspended. I was happy to get a clear marking of the ganache filling so I could distinctly enjoy it! And I'll wrap up with a word on the frosting. When I originally saw this recipe from Cooks Illustrated, the frosting was a Swiss meringue type that starts with warming egg whites and sugar. I decided to go with the version posted by Brown Eyed Baker that was far easier and allowed a food processor to do the work (cleanup is on us though). And boy, is this frosting decadently good! Yes, there's corn syrup, plenty of butter and sugar, as well as melted chocolate, involved. Be forewarned and I hope you enjoy every bite like we did! You'll enjoy it if you like creamy, smooth, dark, and rich truffles. Believe it or not, I actually scaled down the frosting recipe by 25%. I still managed to frost my dozen cupcakes quite generously, as you can tell. Though my husband might not agree with me, you can easily be content with a more modest amount of frosting if you want. If you plan to pipe the frosting (I used an round open tip for most of them), you'll need more frosting than if you were to simply spread a layer on top with an offset spatula. I'll leave the decision/discretion to you. These are cupcakes truly worthy of a celebration and they were a decadent enterprise. I really adored these chocolate cupcakes more than I thought I would! I found myself looking forward to my cupcake at the end of the day, until, all too soon, there were no more. Maybe it's a good thing these cupcakes are a bit of a project to make because they are irresistible and a person can make a habit out of eating one everyday. I know I'll be feeding off the memory of these knockout chocolate cupcakes for a long time to come...they are that memorable! * This is 3/4 the original frosting recipe and it makes enough to generously frost the dozen cupcakes like I did here. If you are looking to frost the cupcakes a bit more modestly, here are are the amounts for half the original recipe: 10 tbsp butter, 1/2 cup powdered sugar, 6 tbsp cocoa powder, pinch of salt, 6 tbsp light corn syrup, 1/2 tsp vanilla, and 4 ounces melted dark chocolate. Make cupcakes: Preheat oven to 350 degrees. Line a standard muffin pan with 12 paper liners. Place chocolate and cocoa into a medium heatproof bowl and pour the hot coffee on top. Let it sit, covered, for 4-5 minutes, then gently whisk together until smooth. Refrigerate the mixture to cool completely, about 20 minutes. Whisk flour, sugar, salt and baking soda together in another bowl. Remove chocolate mixture from the refrigerator and whisk in the oil, eggs, vinegar, and vanilla. Add the flour mixture and whisk until smooth. Divide the batter evenly among the 12 cupcake liners. Place one slightly rounded teaspoon of ganache on top of each cupcake. Bake until cupcakes are set and just firm to the touch, about 17-19 minutes. Let cupcakes sit in the pan on a wire rack for 10 minutes, then remove from the pan on to the rack to cool completely, about 1 hour. Make frosting: Place butter, powdered sugar, cocoa, and salt into the bowl of a food processor and process until smooth, about 30 seconds, scraping the bowl as needed. Add corn syrup and vanilla until just combined, 5-10 seconds. Scrape the sides of the bowl, add the chocolate and pulse until creamy and smooth, about 10-15 one-second pulses. Frost the cupcakes as desired. Frosted cupcakes can be stored in an airtight container for up to 3 days. I stored them in the refrigerator, bringing the cupcakes up to room temperature before serving. Enjoy the "ultimate" chocolate cupcake! Happy Blog Anniversary, Monica! These decadent chocolate cupcakes are perfect for the celebration...gosh, look at that chocolate frosting! I am drooling..
p.s Do you think I can use maple syrup or honey in the place of corn syrup? Thanks! These cupcakes are a serious indulgence...that chocolate flavor is legit. As to your question - I've never done a substitution but it's often cited as options for those who want to use something else (I've also heard of using brown rice syrup). I would just bare in mind that maple syrup, honey, etc. would change the flavor a bit...but that's not necessarily a bad thing. Also, you really could go with less frosting...a little goes a long way (though maybe not if you ask my husband). Happy 6th Blogiversary Monica! These chocolate ganache cupcakes are the way to celebrate. It is only 0830 here but thinking this would be the breakfast of a champion with an espresso. Take care! An indulgent breakfast once in a while can be a beautiful thing! Thanks, Bobbi. Happy blog-iversary! Woohoo what a great way to celebrate. I know you may not believe this, but I have my CI baking cookbook open on a stand in my kitchen, and the page is on a THIS very recipe. I've never made them but always wondered if they are as great as they sound. Thank you for confirming that these are terrific! Can't wait to find a time to give them a try. Your cupcakes look fantastic. That is too funny, Tricia! Thank you for sharing that. : ) Does the recipe in the book feature a different frosting? I couldn't resist going with this easy food processor one and I wouldn't change it next time after tasting it. I remember when I first saw the recipe in one of the magazine issues...I really wanted to make it - chocoholic that I am. It took ages but I'm glad I finally did. They were just so, so delicious. I think you should try it!! Happy 6th blog-anniversary Monica!! I'm so glad to have "met" you thru blogging! And wowza - these look like chocolate heaven! A perfect way to celebrate! Thanks so much, Ashley. I'm also very happy to know you in this way. Keep doing what you do so well! These look amazing, that frosting is so smooth! That frosting is so decadently delicious! Congratulations, 6 years that is a long way. Beautiful cupcakes and pictures! I will put them on the list! I know it! I guess we just never stop eating so it's been "easy" to keep this up? Thanks so much! Coffee is good with it for sure. 6 years!!!! Wow!! Congratulations my dear! It is definitely a long time to continue to do this with so much passion. And these cupcakes are so so delicious sounding. I need to make them. I have a list of desserts I want to make next week for spring bread, this might just be one of them, they look decadent. Have a lovely week my dear. You make such beautiful food, Asha. Thanks for the kind words. Congratulations, on your 6th Blogiversary, Monica! I’m so glad that I found your blog. Thank you so much for the wonderful recipes, and the tutorial you give wit each recipe. Best wishes for many more years! Love seeing you stop by here, Balvinder! You are very kind and I love learning from you. I wish I could pass some out. They were so good. Thank you, Anu. First, congratulations on six years of blogging…I'm right behind you and my six years will be in May. This sounds like the perfect chocolate cupcake, especially if Cook's Illustrated called it the ultimate. Many more happy years of sharing recipes with us. Thanks so much, Karen. Happy almost 6-years to you, too. Hope there is much more great food and happy travels coming your way for a long, long time! Happy 6th Bloggiversary, dear Monica. These chocolate cupcakes look scandalously delicious. I wish I could taste them, Monica. Having said that, I am always super excited to visit your blog... This blog is your face, your genuine personality and I love people who are passionate and unique. I wish you many and many 6 year blog anniversaries. Oh, that is so sweet. I'm so happy to have "met" you and I appreciate all your kind words and encouragement. Love being inspired by your different posts too. I never know exactly what to expect and that is fun. Hope you keep sharing a bit of your life with us for a long time to come. Happy Easter! Massive chocolate craving after reading your post! Happy 6th birthday to your wonderful blog dear Monica. Wish you many many more years of delicious recipes and amazing posts. So thrilled to have connected with you. Thank you, Sonali. I know you are busy making beautiful creations in your kitchen. Much continued happiness to you! Hi there! No worries - everyone is busy and I'm so happy you had a nice trip...need to check it out! Things are good here...we just got back from spring break vacation too. 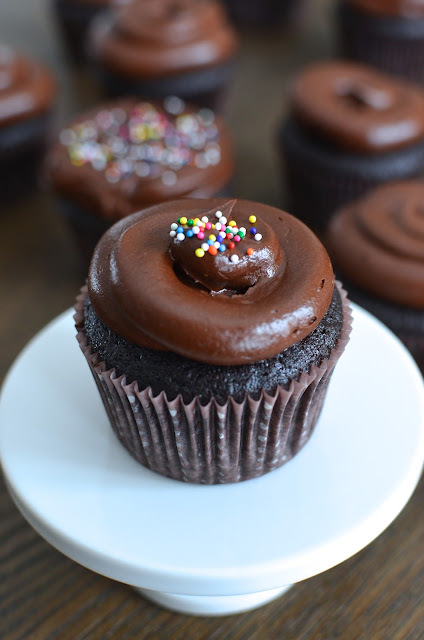 And these cupcakes - girl, they are a chocolate lover's dream. Oh Monica, these all chocolate cupcakes look delicious...and yes, they are perfect for the occasion. Happy 6th blog anniversary! These cupcakes look fabulous! So much chocolate goodness here!! No, we didn't go to Peggy Porschen (I should have asked you for tips before going!) and the name sounds familiar. I just looked it up and the shop looks utterly adorable...but we were not in that area. We did have afternoon tea at Fortnum & Mason. I am so in love with that place!